Infant care is geared to each individual child's needs. 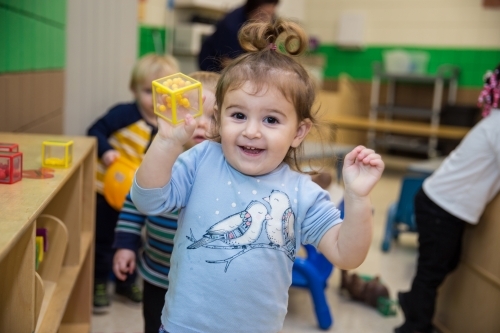 All children are on their own schedule allowing feedings, diaper changing and other times in the day for special one-on-one opportunities that further foster language and vocabulary. Lesson plans are individualized to each child and their teachers use the developmental continuum to plan and implement skill-building activities and experience opportunities. The toddler classrooms are for children who are less than 36 months by September 30th. Half Day: 8:30 a.m.-1:00 p.m.
Extended Care available: 6:45 a.m.-6:00 p.m.